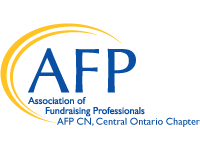 Fundraising professionals, charity executives, fundraising volunteers, and affiliated professionals: AFP Canada Central Ontario Chapter is your professional development association. We are also colleagues who are interested in furthering the profession and in building a professional, helpful network throughout this region. The Central Ontario Chapter of the Association of Fundraising Professionals is just getting started, but from the beginning (we received our official chapter status late in 2015), we have been committed to giving our members the opportunity to connect, engage, and network with colleagues. By sharing and supporting the acquisition of new skills and new information, together we will achieve great things for our organizations and our profession. We are focusing now on delivering useful and relevant educational programs and events to help you reach your goals: whether it is a lunch and learn, special guest speaker, a roundtable discussion group, or 'new year socials', we are planning programs of value for experienced fundraisers as well as those new to the field. We also offer opportunities for career development and camaraderie through volunteering. Help make AFP and the Central Ontario Chapter work best for you! Contact us to learn more and get involved!